I am under the impression that inside HealthShare you can Services, Processes, and Operations. The service takes incoming data, the processes can process that data, and then the operations can send that data out. I am curious if anyone has any experience, guides, or advice on how I can send data to a service using a Java application. I intend for the data to be in XML format. I am also curious if I succeed at picking up the data in the service, how I send the data back to the Java application using an Operation. As of now I am attempting to get this to work on a local environment. Do you have any examples or tracks to use the executeParametersBatch method of %Net.Remote.Java.JDBCGateway? 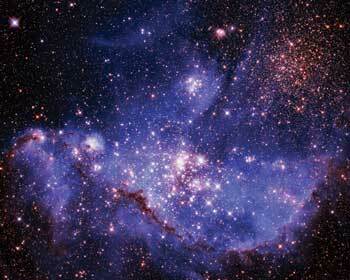 5 years ago, on December 19, 2013, the ESA launched an orbital telescope called Gaia. Learn more about the Gaia mission on the official website of the European Space Agency or in the article by Vitaly Egorov (Billion pixels for a billion stars). InterSystems Caché (to be more precise, the Caché eXTreme Event Persistence technology). The first four will probably sound familiar even to schoolchildren. But what is Caché XEP? We are trying to script a High Availability Shutdown/Start script in case we need to fail over to one of our other servers we can be back up within mins. Is there a way to configure the startup procedure to Automatically Stop/Start the JDBC server when shutting down or starting up cache? is there an auto setting we can change? Where do I download the package cache-jdbc-2.0.0.jar. I'm trying to develop a java app that connects to a Cache Database to grab information? Thank you. Can some can assist with Jar file which is required for the connection or anyone did befoe? We have a new requirement being push down by our Data Security to no longer use Local SQL Accounts to access our Databases. So they asked me to create a Service Account that is on the Domain for our connections to each database. I tried just changing my JDBC connection to using this Service Account and Password but I am not having any luck trying to connect to the database. Login failed for user 'osumc\CPD.Intr.Service'. 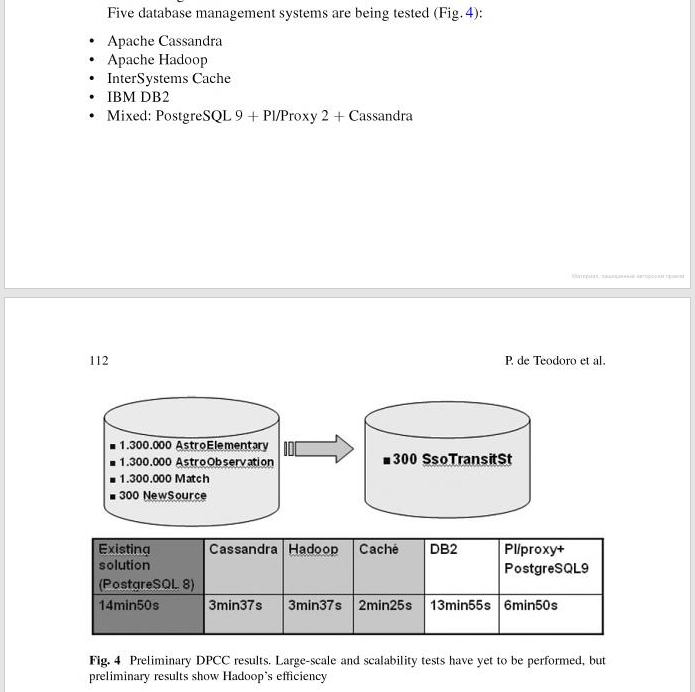 ClientConnectionId:ade97239-c1c8-4ed1-8230-d274edb2e731 "
In reading some of the material about using a Domain Service Account it mentions having kerberos installed. Is this needed for Ensemble JDBC connection to a Microsoft SQL Database to work using a Domain Service Account? Does anyone use JDBC connections to connect to non cache databases using a Domain Service Account? If so how was this accomplished? I have several stored procedures that when I execute them they will only return a single snapshot. In my BP I have been setting this to a Snapshot variable then looping using a WHILE through the snapshot variable just to get that single value. Since it is only a single row, is there an easier way where I don't have to do a WHILE loop to pull the values out of that row? Can I call First Row or something like that to get me just the row into the Snapshot variable? Without installing Kerberos has anyone Authenticated a SQL JDBC connection? Currently we are using local SQL Accounts to sign onto External SQL Databases, but we are being told that we need to switch to Service accounts that live on a Active Directory Domain. I wrote with a little help a ZAUTHENICATE to do the Authentication for Ensemble, can I use something like that to connect to an External SQL Database using a Service Account on a Active Directory Domain? I am trying to develop WAS using Cache and Spring Framework. The ON DUPLICATE KEY UPDATE is not working. Is "ON DUPLICATE KEY UPDATE" not working in Cache SQL? Is there any other way if this isn't working? I developed Web with Spring framework (JAVA, Jdbc Cache) and I wrote SQL when I made it. And Window program with VB6, Cache Object and VisM. 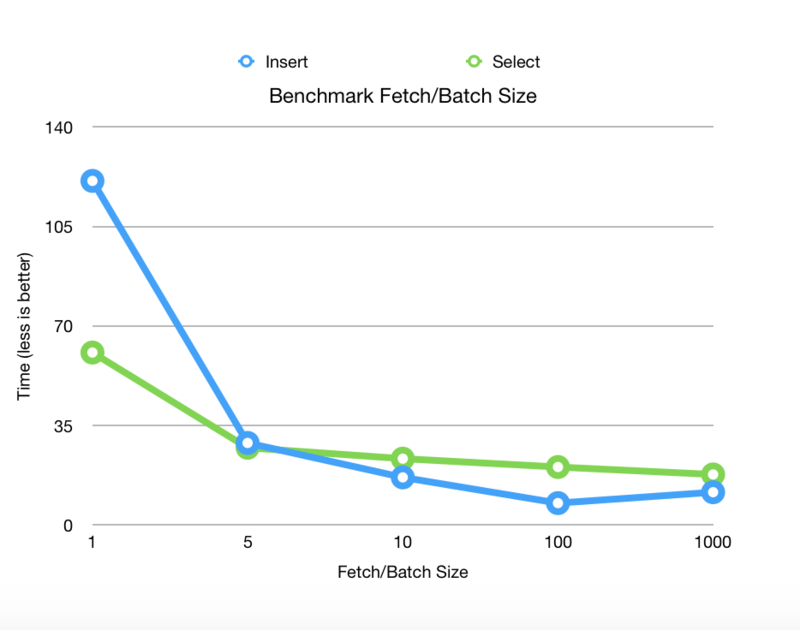 Is there a significant performance gap? SQL and Cache Object? same function, same computer performance just different Java and VB6. The column 'blocked_status' contains the value 'active' is of type 'text'. I figure somewhere the SQL Gateway tries to convert the text value into a long but I can't find where, any suggestions? Has anyone use any other setting then -1 on the Stay Connected setting on a SQL.OutboundAdapter? I am having issues with a particular database and wonder if it would be beneficial since I only connect once a day to read the data from the Adapter to create an HL7 message. I'm trying to create an sal connections from one cache system to another. I've created the connection part and I think that is working. When trying to link a table through the link table wizard, I'm getting an error "<MAXSTRING>zCreateOneLinkTable+52^%CSP.UI.SQL.LinkWizardResultPage1. Is this due to my global block size in the new system not being large enough? It is currently set at 8192. What happens if you don't declare a Persistent value when you call ExecuteQuery()? What does Ensemble set as the key value for your query? I have a query that I've executed on SQL Server, and I get 15 rows, but because this is my second time querying the data Ensemble thinks it exists. The Method in question is SelectProviderClarityAudit. If I call this query multiple times it is not returning the same number of results each time in Ensemble. I'm referring to the document Using Cache with JDBC. Using this example, it sets the URL of the object ds of class CacheDataSource. My question is would you just copy and paste the URL from the login page to the string? I tried doing that and it returns an error saying "Invalid log file xyz"
I ran the below query in three different modes. Coordinated Universal Time is 5 hours ahead of Eastern Time so there is difference in value from column 1 and column 2 in ODBC, Display mode, but not in Logical Mode. By default the query executes in ODBC mode when we query the data from outside world(via ODBC connection). I don't know why query 2 and query 3 outputs different from query 1. Query 2. 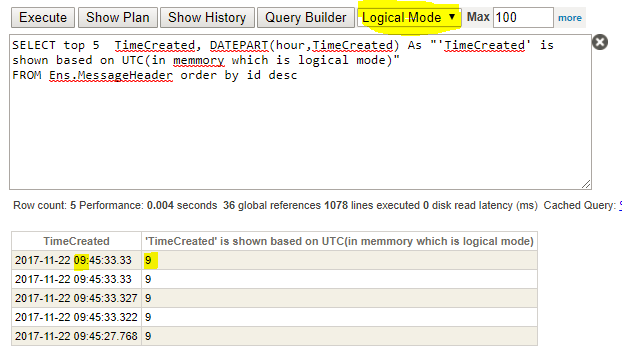 Ran in ODBC mode, DATEPART() took in memory stored timestamp data(stored in UTC) ,but column1 converts data from logical mode to display mode while column 2 is still in logical mode . I am trying to replace one of our SQL Integration Service jobs with Ensemble and I am running into an issue executing a query against a MS SQL database using JDBC drivers. I'm developing an integration between Caché servers by ODBC conection, and I have the following problem. the ODBC driver is truncating the string to 50 characters. If I run this same command with $system.SQL.Shell(), this doesn't occur. I did a test creating several parameters for COSClass_Methode, and they all have a 50 character limitation. Does anyone know why the ODBC Cache Driver limits the number of characters per parameter of this type of call? Or, how can I adjust this?